Discussion in 'Muppet Headlines' started by Phillip, Mar 22, 2012. Watch this new series of web videos sponsored by Bounty to tie-in with the The Muppets on Blu-ray and DVD. Kermit's Party - Episode 2: Gonzo Stunt Spectacular! Muppet Master, FrackleFan2012, Mister Muppet and 9 others like this. I don't care that these are basically paper towel commercials, they're freakin' wonderful! 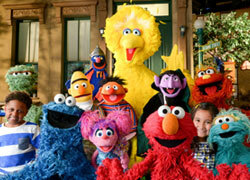 Muppet Master, CaseytheMuppet and Muppetfan44 like this. I agree. These are pretty excellent for a paper towel commercial. You never know, Lew Zealand may show up later. I love how the intro shot into the party house has all these obscure characters - Big Mean Carl, Behemoth, Luncheon Counter Monster, etc. And how the house is decorated with Kermit and Piggy photos. Obviously Piggy was in charge of the decor. Pinkflower7783, Borples and KirbTreelo05 like this. It's interesting that all three have the same opening footage, with different dialogue from Kermit. I noticed none of Frank Oz/Eric Jacobson's characters are present in these. I'm guessing he wasn't available. It would have been great to have seen The Electric Mayhem playing party music. This reminds me of those short Febreeze-sponsored one-minute shows on Nick at Nite (or was it TV Land?) involving a household of dogs. I wish I could remember the title of that show. It's kinda boring they all start the same way too. Great little spots! I can't even decide which one is my favorite, lol. This is awesome!!! Isn't that a picture of Jim Henson in the background as well? Like a few seconds into the commercial? Hey good eye! There is a pic of Jim and some Muppets (including Bert & Ernie) in the background. I only saw it in episodes 2 & 3 though. In the Gonzo episode there's also a photo of the wedding in MTM. Muppet fan 123, DannyRWW and Pinkflower7783 like this. I think I was paying more attention to the pictures in the background more then the commercial itself. Lol! You mean about Kermit and Piggy being married? Yay! What fun. I think I literally yelled "Carl!" and "Rizzo!" at their parts. Good to see them! Could have used a little more background music or flying penguins or something. Seemed sort of quiet for a Muppet party. I heartily approve of Gonzo balancing a shark swimming in finger paint. That's a new one. Kermit: Oh no! Get the Bounty paper towels! Bunsen: We're used them all yesterday when Gonzo tried in-home scuba diving. kyunkyua, KermieBaby47, Muppet fan 123 and 2 others like this. You can only be so Muppety in 1:00. LOL! Or maybe Crazy Harry could cause a big explosion, which would singe the house, requiring a Bounty clean-up. I wonder if there'll be more of these. I was thinking about how we got three in one day, then remembered that when The Muppets Kitchen premiered online, we got four at first. One difference, though, is that we knew of The Muppets Kitchen in advance, while with these ads, we didn't know anything about them until they premiered online. We don't know if there'll be more. These kind of feel like the kind of projects that could have been made in the 1990s, considering the absence of Fozzie, Piggy, Animal, Rowlf, Scooter, and the Electric Mayhem. 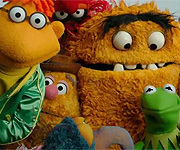 Mahna Mahna is the only Henson character in these who was not recast in the 1990s, and yet he doesn't have any dialogue (though Rowlf, Scooter, and the Mayhem likely wouldn't have had dialogue if they'd appeared if this was a '90s production). In a way, this home reminds me of Kermit's mansion (with all the friends Kermit has it'd make sense to throw a party in a big mansion), but it also reminds me of that PSA where Kermit tells the viewers to imagine if everybody lived in one home. Kermit doesn't live in a mansion remember? He lives in the swamp still when he's not working. Lol. It reminds me of the softly furnished house where he and Pepe shared breakfast in the Cravendale ads.